Blogger Alert! This week at Giant PA, there is a possible triple catalina deal on Post Cereals! 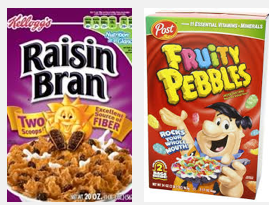 Post Cereals are on sale for $2.50 each AND part of the Buy 7, Earn 400 Extra Rewards Points deal too! The best part of this deal!!!! NO COUPONS ARE NEEDED!!! Check out this awesome deal! Total $17.50 plus earn 400 Extra Rewards Points or $10 for 25 gallons of gas, $4 Milk Catalina, $3 Giant PA Catalina making them only 50¢ or 7¢ each after gas redemption and catalinas!